Aside from the fact that the levelized cost of electricity (LCOE) is higher for wind and solar, there are many other operating costs that result in wind and solar being far more expensive than coal or natural gas for generating electricity. This is a well-documented cost, where power plants, usually natural gas, must be kept in spinning reserve, ready to come online when the wind stops blowing or the sun stops shining. Wind and solar are unreliable, and must have back-up power ready to go on-line at a moment’s notice. First, there is the cost of natural gas to keep these units operating off-line, but secondly, there are the additional maintenance costs from the added wear and tear on these units. Storage is required to minimize the effect of rapid ramping up of fossil fuel power plants when the sun sets, or as an alternative to keeping natural gas power plants in spinning reserve. 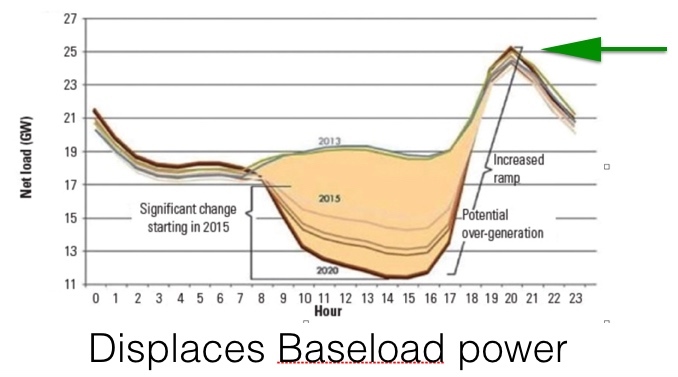 The CAISO Duck curve illustrates what happens when the sun sets, and fossil fuel power plants must be rapidly brought on-line to meet demand. Storage could theoretically provide some of the power needed when the sun sets. The cost of storage varies, but at a minimum is around $2,000 per KW, about the same as the cost of a new natural gas combined cycle power plant. A recent trial by Pacific Gas & Electric resulted in storage costs that were more than twice as large. The CAISO Duck Curve illustrates the sudden ramping as renewables increase. The strongest winds, which are the best for generating electricity, are found hundreds, if not a thousand or more miles away from where the electricity is used. This requires building expensive transmission lines. While it’s true, new coal-fired or natural gas combined cycle (NGCC) power plants may also need new transmission lines, these power plants are located closer to where the electricity is used. The Joint Coordinated System Plan determined it would cost an additional $80 billion to build the transmission lines needed if only half the nation used wind energy, where wind supplied only 20% of the power. More recent is the Pathfinder wind energy project that requires a $3 billion investment in transmission lines. See, Absurd Cost of California Wind. Coal-fired and NGCC power plants were built to operate as baseload plants operating continuously. Because wind and solar operate intermittently, it’s necessary for these baseload plants to cycle up and down, following the constantly changing output from wind and solar plants. Cycling also results in an increase in the number of cold-starts and shutdowns. Cycling puts an added strain on boilers, turbines and many other components of the transmission and distribution system. Thermal expansion and contraction is the main culprit. Different materials have different coefficients of expansion, so boiler tubing may expand more rapidly than the firewalls and other materials surrounding the tubing. Ramping up when the sun sets, as described above, also causes this type of damage. This damage increases maintenance costs. Utilities, such as Duke Power, are installing new monitoring equipment and attempting to develop new operating methods in an effort to minimize the damaging effects of transient temperatures. Industry trade publications, such as Power Magazine and Turbomachinery International, are recognizing the damaging and costly effects of cycling. All of these are operating costs: Operating costs that are borne by the utility and eventually paid for by customers. They don’t include the social costs when there is a blackout, such as occurred in South Australia due to the unreliability of wind and solar. Wind and solar are unreliable, and far more expensive than electricity produced by coal-fired and NGCC power plants. Coming soon: A new website and format. This is a nice little primer, Donn. We could run this at MasterResource with just a bit of introducing and editing on my part. In this regard, do you have a link to go with these two things? Thanks, Donn, You may be interested in some of the regulations/things API are requesting that Trump look at. My experience is not with all the regulation other than hearing operating plants mention some of the constraints, so I’m not sure if any relate to the power industry. Thanks. I made note of them, and will look. What you describe as “backup” has another related cost better referred to as “backdown” or “imposed” cost. Please include it in future publications on this topic. It can be a very significant cost up to $30 per MWh of the intermittent resource. Thank you. The imposed cost you refer to is more difficult to explain in a short article, and there may be some redundancies also. Thanks for your comment, and the costs are real either way. Thank you for the article. As a layman I was unaware of the additional costs associated with renewable energy sources. I hope that someday we will have discovered a safe and consistent renewable. I do have a question – putting cost aside, how fast would we deplete fossil fuels in the cycling model vs. the current system? I assume you are referring to power plants having to cycle due to the use of wind and solar. Using wind and solar would extend the life of fossil fuels, oil, coal and natural gas. From a practical viewpoint, it really doesn’t matter. By the time these resources are actually consumed, science will undoubtedly have developed new methods for extracting energy, such as with fusion. Hydrogen is universally available, except it’s locked up in compounds where it takes more energy to release it than is gained. Weekly Climate and Energy News Roundup #268 | Watts Up With That?